From shooting their enemies with darts and arrows to crushing their skulls and even harvesting body parts as trophies, the ancient foragers of central California engaged in sporadic, and sometimes severe, violence, according to a new archaeological study spanning 5,000 years. In an effort to understand life and death in one of the ancient West’s most populous regions, anthropologists conducted a landmark study of its dead, cataloging signs of violence found in burials between the Sierra Nevada and the San Francisco Bay, dating from historic times all the way back to 3000 BCE. After 13 years of mining the data, the researchers identified what they say is a complex pattern of episodic violence, driven by forces as diverse as competition for territory, pressure from a changing climate, and the arrival of Europeans. Chronicling 16,820 burials from 329 sites among 13 different ethnographic groups, the data reveal that the most common type of violence over the millennia was so-called sharp-force trauma, caused by projectiles like arrows or atlatl darts, which appeared in 7.2% of the burials studied. Another 4.3% of the hunter-gatherers suffered apparent blunt-force trauma to the head, while just under 1% showed evidence of dismemberment, with limbs, scalps, or heads having been removed after death. These grim findings illustrate the periodic conflicts that took place among California’s prehistoric groups in response to the historical, environmental, and social circumstances around them, said Dr. Terry Jones, an anthropologist at Cal Poly who co-authored the new study. 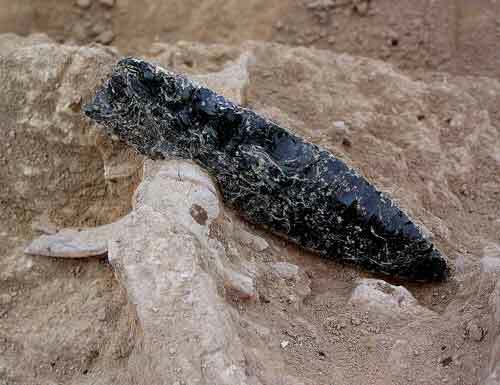 “Many people still seem to think that prehistoric California was a violence-free paradise, but the archaeological record shows clearly that that was not the case,” he said in an interview. Jones and his colleague, co-author Al Schwitalla, initially set out to determine whether any rise in violence corresponded with the centuries-long series of droughts known as the Medieval Climatic Anomaly, which persisted from about 800 to 1350. “I had found evidence in central California for apparent responses to the droughts, in the form of breakdowns in trade relations, changes in subsistence, and shifts in settlement practices,” Jones said. While changes in climate patterns likely served as an undercurrent of the region’s prehistoric conflict, the results instead revealed two spikes in violence both before and after the droughts. The first, and arguably more gruesome, episode spanned from 500 BCE to 420 CE, when dismemberment and trophy-taking appeared to peak. This early period also saw the first major increase in projectile-based violence, perhaps, the authors note, coinciding with the introduction of the atlatl dart-thrower. Indeed, the pair points out, this thousand-year-span appeared to be a tumultuous time throughout all of ancient California, as many hunter-gatherer groups migrated to new grounds, and new ones arrived from the east. “Ethnic violence seems to have been a factor in prehistoric California, as an early increase in violence seems related to the arrival of new peoples,” Jones said. The second spike in violence detected in the skeletal remains took place much more recently, during the early historic period from 1720 to 1899. Here, injuries by sharp projectiles were far more frequent here than at any other time — evident in about 10% of the sample — due in large part, the researchers say, to a new technology. “The introduction of a new weapon system — the bow and arrow — definitely changed the social and political landscape, increasing inter-group conflict,” Jones said. But this second spike in violence was also “almost certainly” inspired by the arrival of Europeans, Jones noted, with the first permanent settlement having been established in the 1760s. “Violence did not begin in California with the arrival of Europeans — although it did increase at that time,” Jones said. In addition to direct confrontation with the colonizers, the arrival of Europeans likely caused a “rippling effect” of conflict, he added, as groups began to migrate away from the violence, disease and social upheaval that it brought. 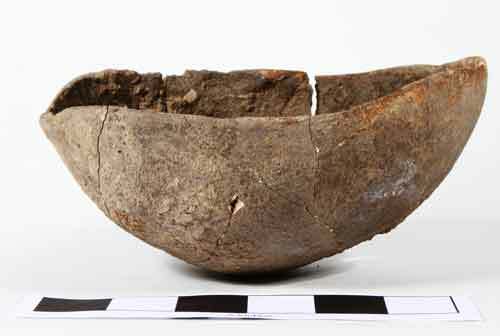 The frequency of projectile injuries at this time showed up most often in the foothills of the Sierra Nevada, approaching 25% in the burials sampled there, and figuring prominently among the bands of the Sierra Miwok. Throughout the 5,000-year survey, the researchers also note, evidence of violence was almost always more often common in men than in women — with the notable exception of blunt-force trauma. “Females also on occasion participated in combat with neighboring tribes and colonizers, although to a lesser degree relative to males,” Jones reported. Indeed, rates of head trauma were only slightly less common in women than men — 4% of females, versus 5.5% of males — an observation perhaps supported by the many historic accounts of women taking up arms alongside men in the Miwok, Costanoan, and Patwin, among other groups. Taken together, Jones said, their data portray periodic bouts of inflamed violence among Central California’s ancient indigenous groups, rather than a long, steadily increasing trend. But violence was always present, despite what Jones sees as a tendency by modern historians and anthropologists to overlook native conflict. “It seems that everyone wants to envision some Eden-like period in the past when there was less violence,” he said. “Violence is an uncomfortable topic, especially for some Native American descendants. Certain naive environmentalists also seem to want to cling to the notion of prehistories free of any social or ecological ills. Jones, Schwitalla, and their colleagues detail their findings in the Journal of Anthropological Archaeology. And most soft-tissue injuries don’t show up on skeletal remains, so this is pretty certainly a gross underestimate. It’s a lower floor. That would be totalitarian Global Warming newspeak for the Medieval Warm Period. You know, the previous natural warming cycle, that was warmer than today. Gee! This runs counter to the narrative of university professors and other sophisticates, who say that indigenous peoples lived in golden harmony among themselves until displaced by evil white Europeans. This needs to be suppressed. They were displaced by evil degenerate Europeans. How does this change those facts? Reply to Leonard Martinez: That is not what university professors teach; it is not even what Hollywood teaches, although, Hollywood has failed to depict any of the pre-European history of North America demonstrating conflict and wars between tribes that the university professors do teach about. What you learn from the university professors is much like what you learn from the Book of Mormon, some tribes were righteous and some were not and sought to conflict with the peaceful tribes. The Book of Mormon also describes dismemberment of slain enemies as part of the ancient wars between Native Americans. Where does the image of the peaceful Native Americans who never had any wars before the Euros showed up come from? That came out of white guilt in the 1960s, in response to acknowledging the Native American Holocaust, youthful minds imagined them as people without troubles or sin. It is folklore. It is not what is taught at the universities in the Native American studies or history courses. Peace among the Natives prior to the Euro arrival was regional in scale, where tribal treaties and alliances allowed for unified defenses against unfriendly tribes that would not agree to rules of fairness. The Iroquois Nation was a confederation of tribes who practiced representative democracy to maintain peace within their alliance. The tribal and clan chiefs in the Pacific Northwest used to gather for potlatches at which one chief would give away all of his possessions to the others. That chief would then recollect possessions by attending over time the potlatches of other chiefs until it was his turn again to give away his possessions. Somehow this helped maintain the peace among the Native in the Pacific Northwest of what is now the United States and for this, Allah rewarded them with abundant salmon and other resources. I’m sorry, but I find your lack of clarity disturbing. So, more apologist research to whitewash the genocide, when it is clear that there were indeed times of drastically less violence? These “raw” percentage numbers are clearly telling a desired narrative. Otherwise we would have a graph showing the percentages over time, which would clearly show that there were long stretches of time exhibiting significantly less violence than we would find in Europe or post-Columbian America. And yes, I count starvation at the hands of a lord or king to be violence. The Native Californians were constantly being invaded by Great Basin tribes like the Uto Aztecans , Hokans, and pentuans, trying to take over their ancestral homelands.. The territory was very small and not a lot room . The tribes I mentioned invaded california from Nevada , Oregon . California Native tribes were probably protecting their homelands against invaders trying to take over their territories. The Yuki, Wappo, Chumash and a few others speak language isolates, and are the descendants of the founding people of California, and had every reason to defend their territories.’the Chumash Indians and others were not violent, they were defending there families against invaders. The Chumash Indians have lived in the same homelands on the SB Channel Islands and on the coast from Malibu to Paso Robles for at least 12,000 years. They are expert mariners and Planked boat builders and deep sea fishermen and money makers and ran trading networks. They were the most powerful nation in California And had the most members at 30,000. Since they were the earliest Californians, they got the best lands on the coast. No one messed with the Chumash .california had the most indian population and the most languages and isolates.it had a patch work of tribes and languages, being so crowded they were bound to have more conflict, than say, the plains indians. This is stupid! How the hell can there have been ” Ethnic Violence” when even their worst enemy was the same race?! I think they are trying to bring a racial hate element that is not there to begin with. Just like the Violence is normal argument that says ” look Native Americans were violent to, look what they did to each other”! Now they say ” hey look! The native Americans were racist to each other” and “were not the only racists in America “. Native Americans had tribal wars or clan wars. They were nothing like the murderous dregs that invaded their ancestral homelands, genocided 98 percent of the people, and brought disease and vermin into their midst, theives of homeland and birthright of the only American race, the Native American Race! Pathetic lies and used to justify genocide. Small peanuts to the real crime of genocide that has taken place in the Americas, brought on the wings of death.